The Ramblin’ Jesters is an elite invitational sevens team in the grand tradition of the Barbarians and other compilation teams, operating out of London in the UK. They have won the Rosslyn Park Floodlit 7s (beating London Irish and five-time winners Harlequins en-route to the final) and the Rugby Rocks Festival in London and the Copenhagen 7s in Denmark. In addition, the team has also finished runner-up tp the German national team in the Nancy 7s tournament in France, and, on their first trip to the USA, took third place in the Serevi RugbyTown 7s in Glendale Colo., finishing 6-1, and losing only to the eventual winners, Denver. 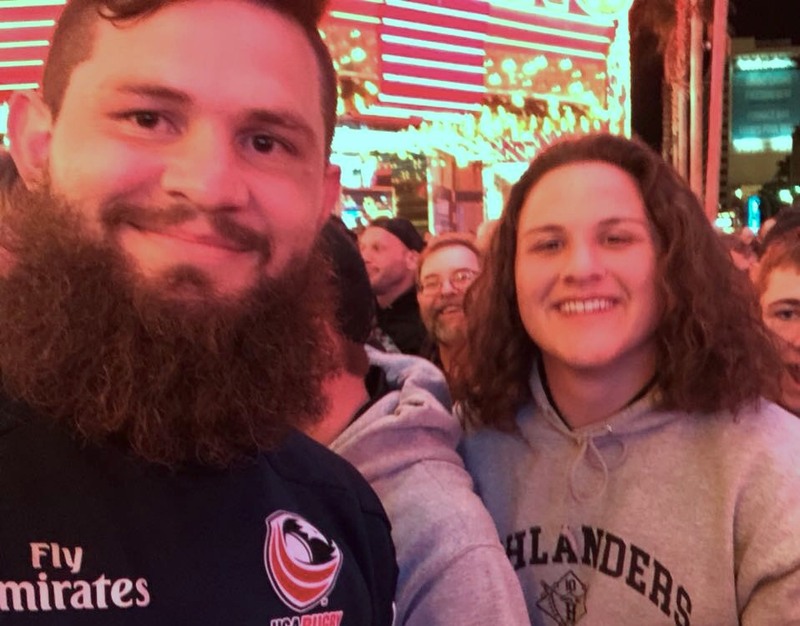 The Ramblin’ Jesters are keen to grow their US activity and connections and create opportunities for players on both sides of the Atlantic to play rugby to an elite level. The Ramblin’ Jesters are pleased to sponsor this Goff Rugby Report USA Young Sevens Player of the Month Award. A commit for Mary Washington for the fall, Brennan is a 5-10, 215-pound honors student from Corinth Holders HS and a key contributor to the Chapel Hill Highlanders' success. Often we feature speedsters in this award, but Brennan's talent is power. He played for Atlantis at the Las Vegas Invitational, and with that team, as with all, he has brought physicality to his game. So no surprise he made sure he got a picture with USA star Danny Barrett in Vegas. Chapel Hill coaches Robert Joseph and Jason Niemiller play a system similar to that of UMW, and it will make Brennan a good fit in Fredericksburg. The center/flanker helped Atlantis excel in Las Vegas, and looks to be a North Carolina select side player this summer once more. He is also a state-level wrestler. This year, in addition to playing NC’s best HS programs, Seamus has played in Las Vegas for Atlantis US Sevens Rugby at Inside/outside center and flanker. Seamus has also played for the NCYRU State Rugby All Stars and is a NC state level wrestler. We cannot wait to see Seamus and his parents on campus this fall! Seamus Brennan is our Ramblin’ Jesters Young 7s Player of the Month. For more on the Ramblin' Jesters, see here.